Known as the M1850, Staff and Foot Officer sword, this style of Civil War saber was widely issued. Our heavy weight replica has the same attention to detail that made these historic swords so memorable and cherished. Features include a high carbon steel blade with engraving, brass guard, and hardwood handle with black leather and wire wrapping. 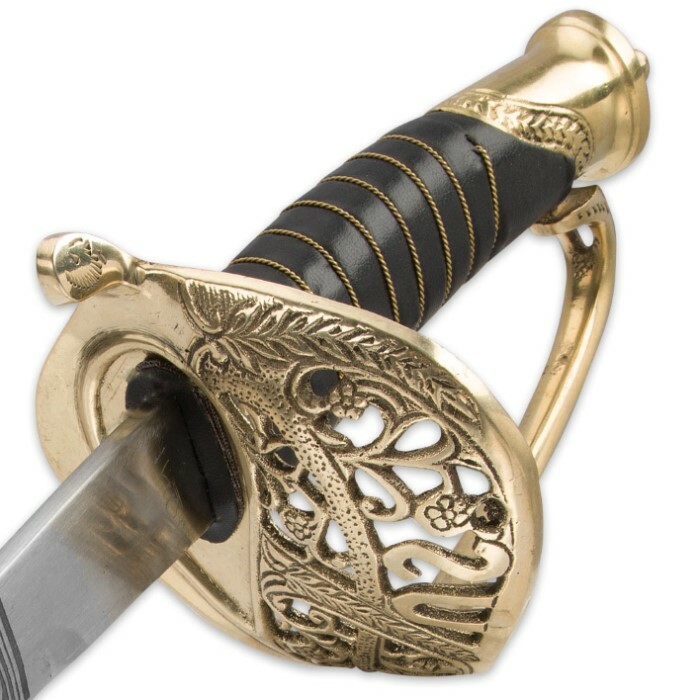 The matching scabbard is accented with brass and includes ring mounts for attaching to a Civil War uniform belt (belt not included). Ideal for re-enactments, Civil War displays, form training and more! Measurements: 31 3/4 in. blade, 37 1/4 in. overall. Great buy. The sword came in less with a week and was well packaged and oiled. It's a beautiful well made blade for the price and my first as i plan to collect more. Sadly it did not come sharpened but the tip was sharp. My only problem was that a small pecie of lather glued were the blade attaches to the hilt came off and that it dosnt fit into the scaboard all the way smoothly. This cane be solved by sliding it in am out until it finally smoothes into the blade. 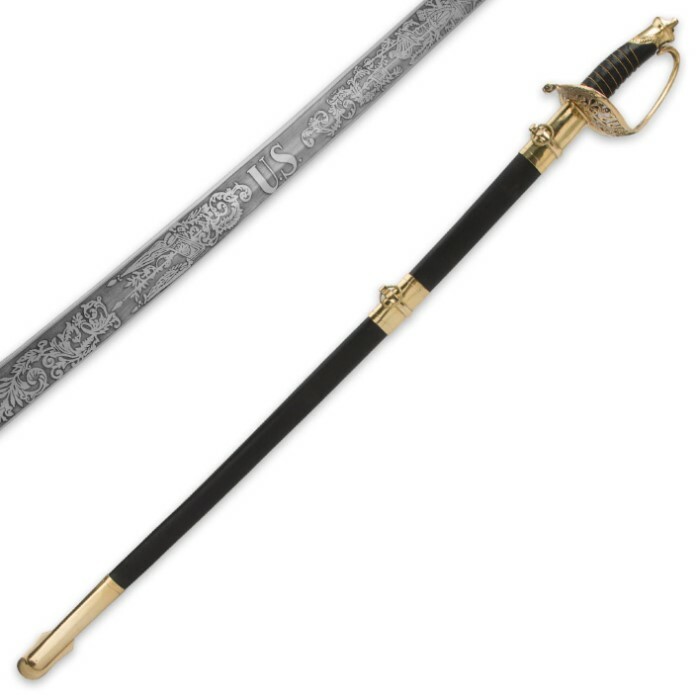 Other than that it's a nice and beautiful sword and defenitly worth the 60 dollars. I had been looking around for a good all around sword and then found this beauty. 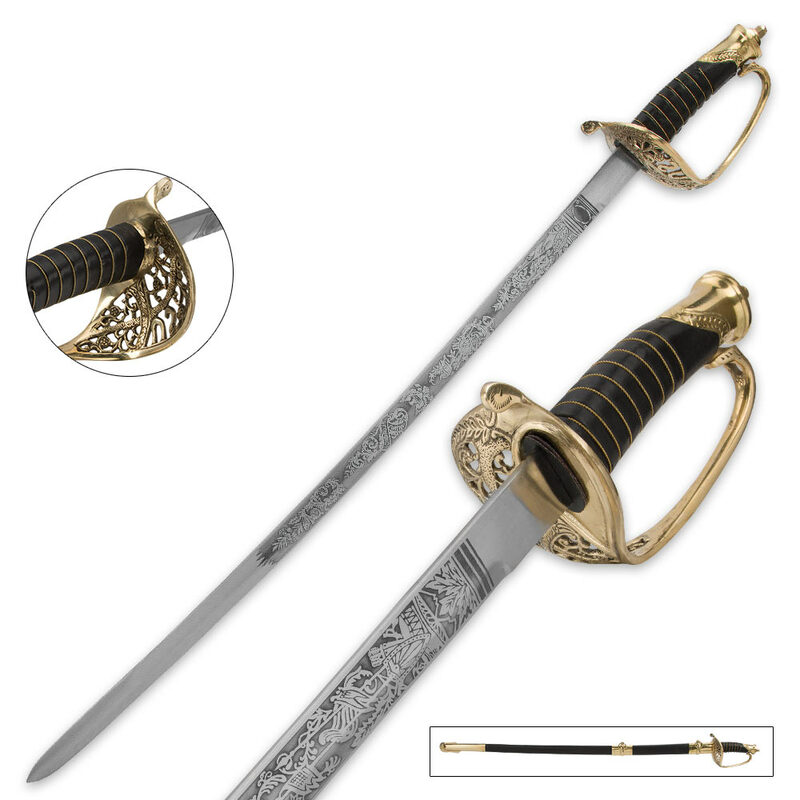 The sword is expertly crafted from brass and the blade of the sword has well inscribed details. The sword is well balanced, and the grip is comfortable to hold. A great buy and would recommend to anyone looking for a well made sword. Yet another great buy! The weight and balance is very good on this piece, and the elegant design is nothing less than pleasing. My only complaints were the few scuffs and scratches on the hilt, but in totality it's not a big problem (including the fact that this sword is going to be used as a prop, some ware is actually welcome). The scabbard also had a few small problems. The brass mouth piece was a little tight, but after some slight filing, the blade fits just fine. Also, the coating of paint was flaked in a few places, however it's not enough to complain. All in all, even with all the minor blemishes, this was still a great buy. And I would gladly do so again if the need arises. Wanted one of these for a long time. Could not afford the $150+ price. Quality on this one is excellent. Got me a reproduction Union Army Officers sword knot for it and it is now a dead ringer for the one used by "General Armistead" in Picketts charge from the movie "Gettysburg". Wow! This sword was given to me as a gift. I'd had looked for this one or a simular type sword for a long time,but they were more expensive. I mounted it on my wall, and looks really nice for display. I highly recommend it.